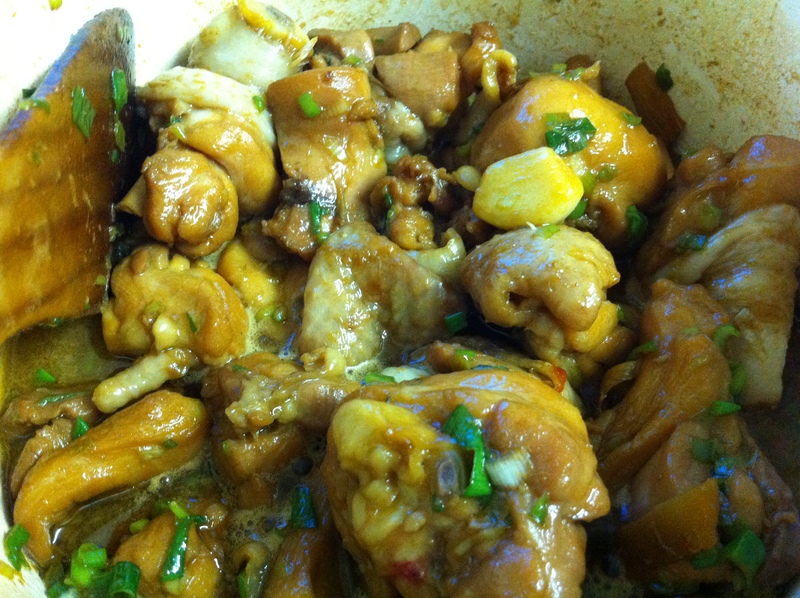 HURRAH FOR THREE CUP CHICKEN (ALMOST…) | YUM YUM PIGGY'S BUM...! Seriously depressed the other night…. Had a horrible afternoon at work wishing I was anywhere else besides work. Got into trouble because I wasn’t doing enough work despite the fact my employer hasn’t been paid me for the past 2 months. The cheek of it! Low on cash, low on happiness. Needed something cheap, fast and tasty to eat at home as can’t afford to go out and eat at restaurants every Friday. Plus wanted to make sure my boyfriend was satisfied in the food department as he works so hard and deserves lots of lovely treats. Passed by my local supermarket and checked for any special food offers, luckily chicken thighs and drumsticks were half price (about £2.60/kg) so I couldn’t resist. Remember seeing a dish called “three cup chicken” in some Chinese restaurants a long time ago and was intrigued to find out more. It’s a Taiwanese dish which basically has three main ingredients, dark toasted sesame oil, rice wine and kecap manis in equal proportions. Three cups of these ingredients is actually alot of sauce, maybe in the olden days, they used those small Chinese tea cups that people drink out of instead to measure a cup. This is a flavorsome dish so this is fab for garlic lovers as alot of garlic cloves are added! Great for keeping vampires away! Traditionally the chicken is cooked in a claypot, not sure how much difference this makes as I don’t have one. This turned out fine in a casserole pot. 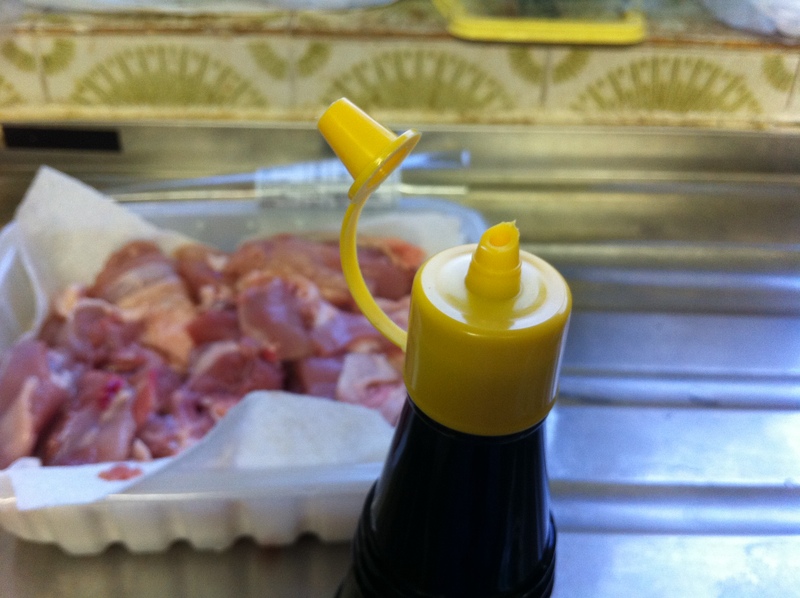 Ta-da, cutting the nozzle enables one to transfer kecap manis onto food! Look out for these ingredients in your Chinese supermarket. Dark toasted sesame oil is preferred as the aroma is stronger than light untoasted sesame oil. Shaoxing rice wine can be substituted with sherry. Kecap manis (pronounced “ket-chup maness, like ketchup as in tomato ketchup, funny as kecap manis contains zero tomatoes) is an Indonesian condiment. It’s a dark coloured liquid which is sweet and slightly salty. If you can’t find kecap manis, use light soy sauce and add palm sugar until sweet enough for your liking. 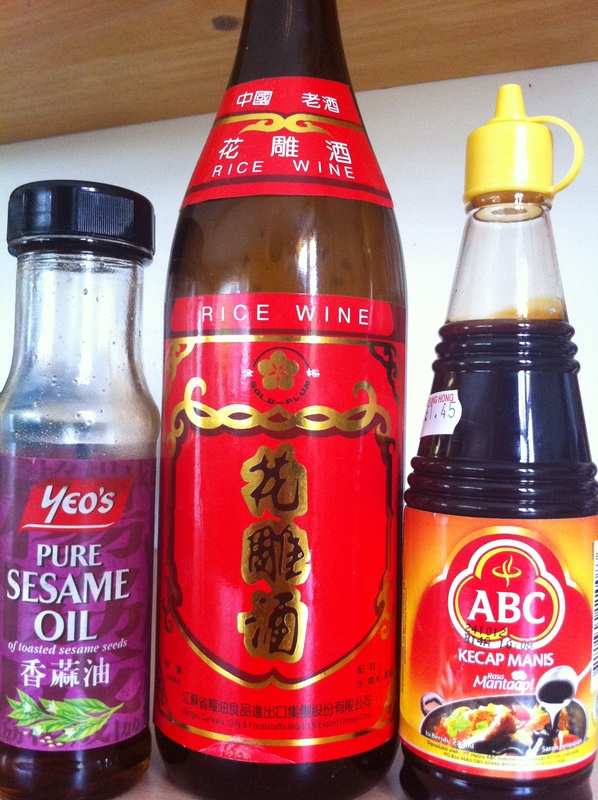 Worringly, I couldn’t work out how to get the sauce from my new bottle of kecap manis. Had to hand it to my boyfriend to deal with the situation. Silly me, I just needed to cut the tip off the nozzle! Found a recommended recipe from the “Rasa Malaysia” website. It’s a great looking site with excellent photos with recipes on different Asian cuisines. Had to make a few changes as didn’t want to chop chicken drumsticks into 3 pieces as there was a higher risk of splintered bone stabbing my boyfriend’s mouth while eating plus was too timid to accurately chop bony pieces with a Chinese cleaver. So I chopped chicken drumsticks into 2 pieces and deboned chicken thighs so there was a mix of boned and deboned pieces. Definitely recommend thighs and drumsticks rather than breast because the texture is meaty and more succulent. Another change was that I could not find any Thai basil leaves after scouring my local market, Chinese supermarket and a few ethnic stores so had to substitute these with chopped spring onion. Didn’t fancy using the type of basil used in Italian cooking as I think the taste and aroma is too different for this dish. Also added a few dried red chillies for an extra taste dimension. One technique some readers may not know about is tenderising chicken with bicarbonate of soda (baking soda). Alot of Chinese people add this to meat to ensure a tender, silky and succulent texture. As long as you rinse off the bicarbonate of soda after tenderising, it shouldn’t have any weird aftertaste. My brain got so mad and frustrated that as soon as work finished, it made me dash into Wilkos, looked desperately for Thai basil seeds, marched to the till, paid for it and ran to catch my bus. 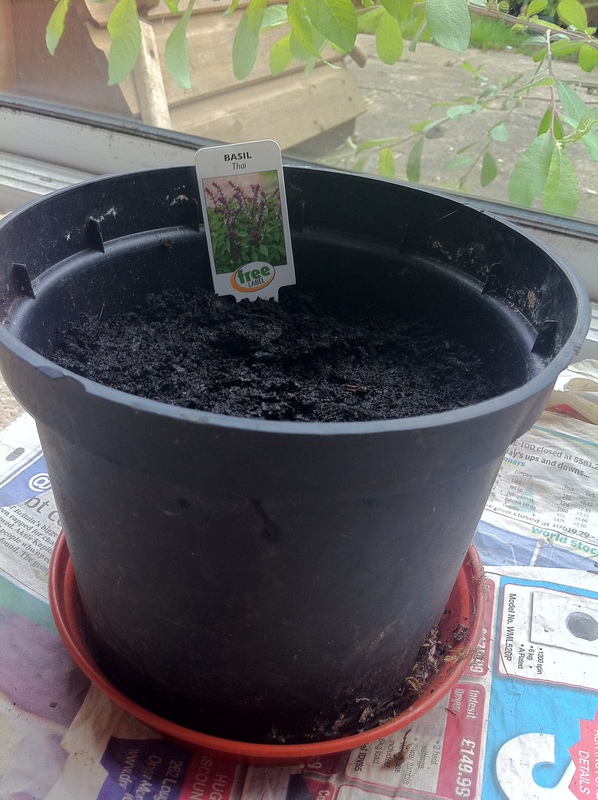 Got home and immediately planted those seeds despite me feeling so tired and warped in the head. Will let you know when I’ve grown enough Thai basil so I can remake this dish properly and tell you whether this ingredient is definitely needed. Plus I just want to smell the aroma, check out the flowers and cook more Thai dishes. I really enjoyed eating three cup chicken, easy and tasty and boyfriend approved. Loved the whole cloves of garlic and strong complementary flavours. However I just kept thinking, I wish that Thai basil was wilting away in the chicken pieces releasing gorgeous fragrant aromas. Alas, c’est la vie, we have to make to with what we have already. You can read the original recipe at Rasa Malaysia here. Chop chicken drumsticks and thighs into 2 or 3 pieces with a cleaver. Sprinkle bicarbonate of soda over chicken, massage this over the meat and leave for 10-15 min to tenderise. Rinse the bicarbonate of soda thoroughly off the chicken with water and pat dry with kitchen paper. Heat up a casserole pot on medium heat, add the sesame oil, leave to heat for about 1 min, then add ginger and garlic and stir fry for 1 min. Add the chicken pieces and stir until the chicken is coated in the oil. Add the soy, Shaoxing rice wine and kecap manis and stir everything together for 1-2 min, the mixture should be bubbling away. Cover the pot, turn the heat down and simmer for 5 min or until the chicken is cooked. Uncover pot, add spring onions and Thai basil, stir and serve immediately.